Note: Winner of the Laurel Futurity last year, he started off 2006 by winning the Tropical Park Derby to be undefeated in 3 starts on the grass. Made his first dirt start a winning one in the Holy Bull Stakes at Gulfstream in the slop and followed up with another win on a fast track in the Florida Derby. Excellent dosage profile for the Derby and definitely one to watch. Stalked the early pace and took the lead just before the mile marker and drew away to win by 6 1/2 lengths in the Kentucky Derby. Sadly he broke down just after the start of the Preakness and is recovering from surgery. 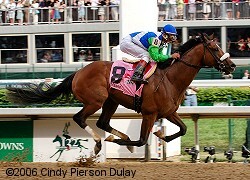 Barbaro Update - details about his surgery and recovery.